CHELSEA space is delighted to present A Wind of Revolution Blows, a new series of works by Sharon Kivland which insist on the relation between fashion and revolutionary moments in the history of France. 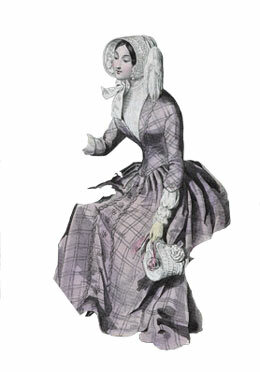 Kivland recreates illustrations from a fashion journal of 1848 (the year of Marx and Engel's Communist Manifesto), which established the principle of the right to work'. She repeats the slogans of the Revolution of 1789 on gloves and echoes the sentiments of the Paris Commune of 1871 in a silver necklace. These objects speak; they have the charming voice of a commodity and together they become a chorus of goods going off to market. History unfolds la mode and fashion courts death through constant revolution. The nowness of fashion shares a transience with historical change and the 'right here, right now moment is almost always over before it really begins. Kivland's re-fabrications look both backwards and forwards. While it was Marx who employed the metaphor of fashion in his 'new ball gown for the old bourgeois', it is Kivland who makes 'to wear' a verb of affirmative action. On the streets historical materialism is reflected in the windows and ubiquitous mirrors of the shops. Kivland's is a practice of refinement, of attention to detail, which is trapped in archives, libraries, the arcades and department stores. It is at the intersection of public political action and private subjectivity.